I recently came across an art and literature magazine for kids - via BIG Kids magazine - which just made my heart sing! Alphabet Glue is created by Annie Riechmann, of Bird and Little Bird blog. It's an affordable, downloadable magazine which you can print out - there are two issues available now. We made three activities within three days of reading them! 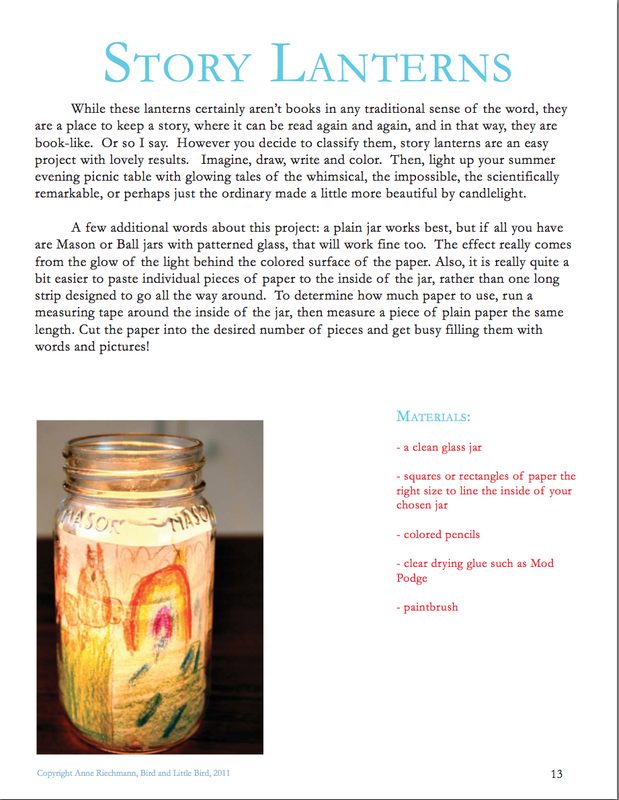 Alphabet Glue includes suggested reading lists for kids, print-outs for library catalogue cards, bookmarks, reading records and story cards, as well as instructions for book-making projects and detective activities. Our story lanterns were based on Laurence Anholt's "The Magical Garden of Claude Monet". We loved the idea of a circular studio room. Monet tells Julie, his young visitor that he is trying to paint the most enormous water garden in the world. When you stand in the middle, you will feel as if you have dived into a pool. There is factual information about Monet at the end of the book. Annalise's favourite page - below - opens out to present Monet's pond. The brush marks glowed like flowers in a garden. This picture book is quite long - more for younger primary school students than kinder kids - you might need to turn it into a "chapter" book and read it in two or three sections for small ones. Laurence Anholt has written a series about famous artists and his books tell a lovely story, while giving seemingly incidental snippets about the artists. Anholt illustrated all of these artist books - imagine being able to imitate the artistic style of not only Monet but Picasso, van Gogh, Degas and Matisse as well! Tom used a jungle theme for his lantern, Annalise a garden. Annie's instructions were simple to follow, and the kids feel really proud of their lanterns, especially as we leave them on the table and light them for dinner. Oh so great you have found the gorgeous Annie! Love your story laterns.